One of the traditional complaints among modellers is that manufacturers pay little attention to their opinions, so it's very refreshing to find a case where a kit producer has not only taken on board some of the adverse comments that greeted the first release of a new model, but reacted swiftly to modify the moulds for the follow-up boxing. 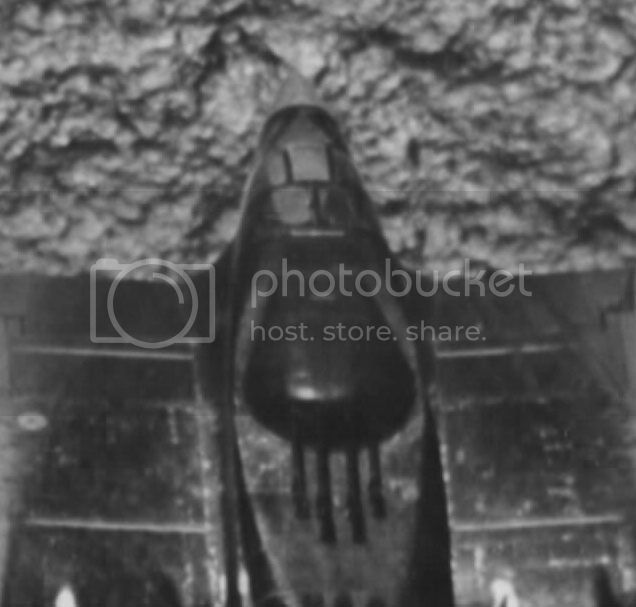 GWH have taken the chance to address some of the issues for their latest release - the turret-equipped P-61A, arguably the "classic" Black Widow in many people's eyes (including my own), despite the fact that the turret proved less than successful in practice. The moulding is extremely good, with crisp details and no signs of flash or sink marks. When I reviewed the original kit, I was dismayed to find a number of parts had been damaged during packing or in transit - well, there are no such problems this time and everything arrived perfectly intact (although, would you believe it, a shelf fell off the wall onto the review-desk and almost crushed the kit! Perhaps there's something about me and P-61s!...). A dry fit is very positive; despite being a twin-boomer, the basic airframe of GWH's Black Widow is a cinch to assemble. Some sprue attachments are on the gluing surfaces, so you need to spend a little while cleaning these up, but once that's done the fit, aided by long locating pins, is really snug, everything clipping together very soundly. I won't go over too much of the same ground covered in the original review. Once again, the interior is very nicely fitted out with over 70 parts spread through the front and rear cockpits and gun bay. Multi-part photoetched seat harnesses are included, and individual decals are provided for the main instrument panel (24 in total, so applying them should keep us out of mischief for a while) along with data plates for the sidewalls and consoles. Totally new for this version is the top turret, with four neatly detailed .50 calibre machine guns and a large "drum" assembly beneath it (which, as far as I can tell, will be hidden in the finished model). There are no ammunition feeds for the turret guns, so there's no option to display the turret with the cover removed for servicing. A 7-part radar antenna is provided, along with a clear nose section. On the real thing, this was translucent (as against fully transparent) so GWH have moulded it slightly "frosted", and you may want to go further with carefully applied thinned paint. The Black Widow's distinctive wing spoilers are once again supplied as etched parts. A nice idea but, as Jean-Luc pointed out, they really don't match the originals. For once thing they are flat and plain, whereas the real ones were curved and perforated, and the way they "operate" is incorrect; GWH seem to have assumed they flipped up (rather like the dive brakes on the A-36 Apache), whereas they really "rolled" out of slots in the wing surface. The easiest thing is to fix them closed, and I'd actually use them as templates to cut styrene blanks to fill the unrealistic recesses in the wings. The kit's engines were always pretty good, but let down by the lack of the distinctive cylindrical reduction gear fairings and any magneto covers. These have now been added, and each 12-part engine features an etched ignition harness. Staying on the theme of the engines, GWH have reworked the cowlings to widen the openings. Admittedly, modifying the originals was hardly a major chore, but it's a very welcome "tweak". Also modified are the propellers, although they are still moulded as simple one-piece units, complete with spinners, which I find a bit surprising in a kit of this overall level of detail. As originally supplied, they had very unrealistic cutaway openings behind each blade, and this has been filled in to create a full spinner which is also slightly larger in diameter now. Sadly,there's still a rather awkward moulding seam to remove between each blade. The blades themselves have also been altered, and are now much more pointed and slender. Sitting them next to the originals, my gut reaction was that they might even be a bit too slim - but comparing them with photos in Squadron's "In Action", they're actually pretty darn close. What is also nice to see is that the annoying sink mark originally on the front of each cuff has been overcome. Sooner or later, you're bound to come to the canopy - the centre of the most serious concerns surrounding the original release. Both the radar operator's canopy and the main cockpit glazing had problems, and GWH have answered their critics by replacing each of them. Dealing with the radar operator's section first, this had spurious misplaced framing, and I think the designers have pretty much got this correct now. I'm not keen on the heavy framing surrounding the side windows, but the fuselage mouldings are unchanged, so this is beyond the remit of the changes. Moving up front, the fact that the fuselage halves are unchanged means the contours at the rear of the gunner's section of the main canopy are still a little angular, but the general impression is definitely better, with a deeper windscreen and a less "squashed look" overall. 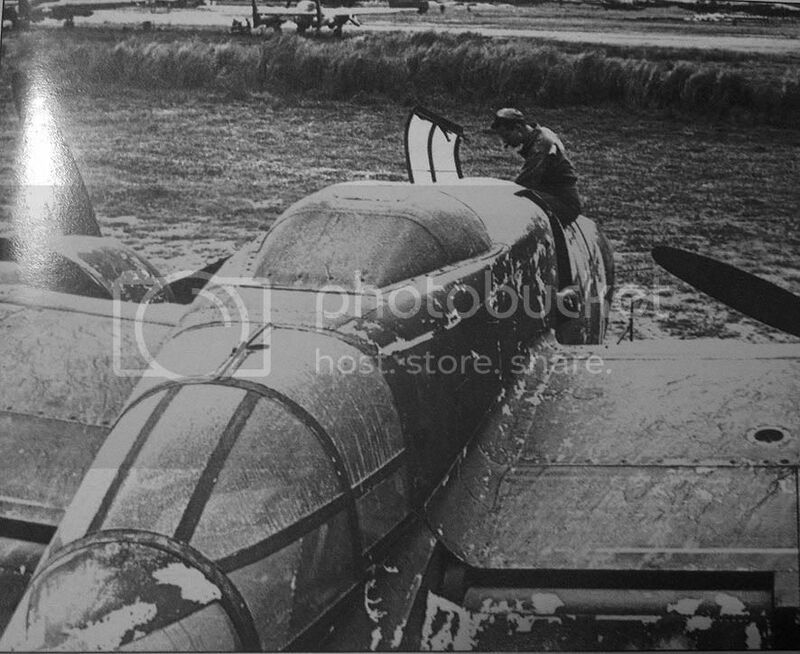 The side panels of the gunner's section do look too shallow to me though - again a result of using the unchanged fuselage, resulting in the base of the canopy being a tad high in that area. Ambitious modellers could polish away the frame line to extend the clear area downwards a little, which will help, but not entirely correct the look. One thing that's unchanged in the new canopy is the "kink" in the tapered edge of the top hatch when viewed from above. I just can't see this in photos of the real thing - it looks like a straight line to me - but what GWH have done is to remove the frame running down the centre of the hatch. In some photos of the full-sized canopy you can make out a line running down the centre, but not a full frame. In Jean-Luc's build of the P-61, he mentioned that the original canopy wasn't a great fit around the base of the windscreen - well, sadly, that's still true, and there's a definite step that will need working on. Similarly, the frame at the rear of the canopy sits proud of the fuselage. The instructions are neatly drawn and simple to follow. Some of the illustrations are lifted from the original kit so, for instance, the old style propellers and clear parts are still depicted, but that won't cause any problems. One thing that is odd, though, is that what appears to be a moulded nose-weight is shown, while none is provided. Perhaps it was planned at some stage but dropped? Colour matches for Gunze Sangyo paints are given throughout, and Vallejo equivalents are shown on a chart. 2. P-61A-5 "The Virgin Widow", Saipan, December 1944, painted Gloss Black overall. The decals appear to be good quality, printed with a gloss finish on two sheets, the first containing national insignia and stencils, with the second providing nose art, tail numbers and the instrument faces. The registration looks spot on and there's minimal carrier film. As with the first release, the blue of the national insignia looks very dark on the sheet, but Jean-Luc used them in his build and the results look very good, judging by his photos. I guess you'd have to say "Two out of three ain't bad". Purists will no doubt bemoan the fact that the dimension of the nacelle are unchanged, but I expect 90% of modellers will be delighted with the kit. The propellers, engines and cowlings are much better now, while the canopies are a definite improvement even if not quite right, so I think Great Wall Hobby deserve credit for providing modified parts and this new boxing is definitely the one to go for. Highs: New parts for the turret and clear-nose version. GWH have improved the clear parts and the engines, cowls and propellers. Good quality decals. Lows: Some issues do still remain, but the kit should more than satisfy 90% of modellers. Verdict: The original P-61 kit built into a very impressive model, despite it's well-documented problems, and GWH deserve credit for upgrading the parts to tackle the most obvious of them. Shhhhhhhhhhhhhhhhhhhh! Don't give him any ideas! True- I know for a fact that some makers do design their kits to acchieve maximum annoyance in certain modellers. Hi. Enjoyed reading the various posts concerning the GWH P-61s as I've always wanted a model of Moonhappy and been unsuccessful with the Monogram kit. (I guess my particular skills don't mesh with its particular problems.) I now have the GWH L4802 kit in hand and think I've got a better shot (with help from the aftermarket). There is, however, an issue (have I come to the right place? LOL) ... I have never seen it mentioned on a modeling site that Moonhappy was the seventh A model delivered WITHOUT a turret (priority was given to B-29s) and yet this latest version of the GWH kit comes with one. Photos seem to show a turret, so what gives? There were at least two versions of a fixed gun installation that installed in the turret well that quite often gets mistaken for a turret. The Squadron P-61 In Action on page 30 shows one such mount (wrongly described as a GE A-4 turret) with the guns mounted evenly longitudinally but with a vertical offset between inboard and outboard guns though noticeably less than the turret. (Another version has a longitudinal stagger of a bit more than a fifty caliber cartridge length between inbd and otbd guns for straight ammo feed shown in Warbird Tech P-61 page 71.) Right next to that picture (in the In Action) is a picture of The Spook right after it crashed, showing one of these non-turrets with staggered guns and a smooth, one piece gun fairing ... THAT is what I'm looking for as THAT is what should be on Moonhappy. The only question is: was this gun installation longitudinally staggered or not. I don't think it was as the staggered ones seem to be on later aircraft. I don't exactly know the source of these gun mounts, but It seems (vaguely) that I recall the first ones were field developed and made and later kits were manufactured (these being the offset?). It also seems that these were used only in the Pacific. An advantage of these mounts was they were much lighter than turrets and could carry more ammo. 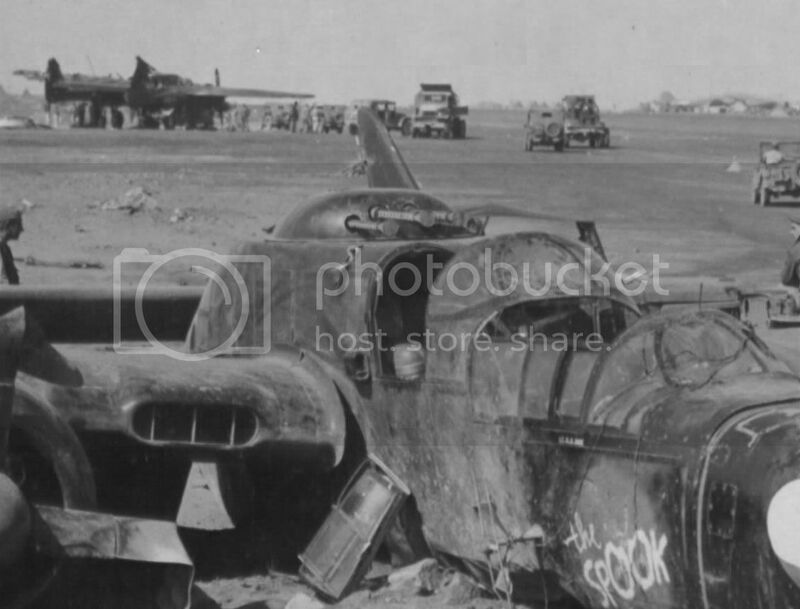 If anyone needs to burn some time waiting for paint to dry it's always fun to search for P-61 photos and identify turrets/non-turrets/staggered/not staggered ... for a few minutes, anyway - lol. Yes you are absolutely correct, the turret that GWH made is inappropriate for the two aircraft they provided markings for. Both aircraft are from the 6th NFS and both had the upper guns in a solid mount with Hawaiian modification center covers over the guns, nearly all of the 548th and 6th NFS aircraft carried the fixed guns. Here how it should look like: BTW, I'm going to make such turret in resin. Sergey.